Russ Columbo and Carole Lombard - a beautiful melody interrupted by tragedy. 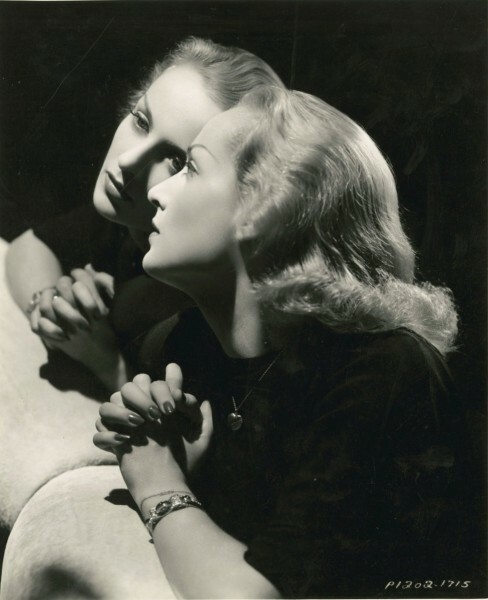 Below is a photo of a pensive, almost haunted looking Carole Lombard that was taken by Alfred Eisenstaedt, the father of American photo-journalism, for her interview in Life Magazine by noted journalist Noel F. Busch in September of 1938 and published the following month. Alfred Eisenstaedt was famous for capturing in a single photo the essence of his subject. The editors of Life chose this revealing photograph for their cover article on Lombard for their October 17, 1938 issue. Here the mask of celebrity is momentarily dropped and we catch a glimpse of the human being behind it. In late 1938 Carole Lombard's romance with Clark Gable, the "king of Hollywood", was in high gear and all over the news. They started dating seriously in early 1936. In late March of 1939, taking a break from filming "Gone With The Wind", Gable and Lombard eloped to Arizona. This photo taken six month earlier captures a Lombard that was as unexpected as the conversation she had with her interviewer, Noel Busch. Busch was a senior editor of Life Magazine and a respected journalist. Fred Peters, Carole's brother later told Larry Swindell, her biographer, that Carole corrected Busch when he referred to Clark Gable as the love of her life. As recounted by Larry Swindell, she fixed him in a level stare and said almost grimly, "Russ Columbo was the great love of my life. And that is very definitely off the record." Who was Russ Columbo and why did he leave such a lasting impression on Lombard even though they had barely a year together, (September 1933 to September 1934), that even after a six year relationship that included marriage to Clark Gable, thought to be "the most desirable man in America", (January 1936 to January 1942), she was still drawn to Russ? Russ Columbo was a popular singer, orchestra leader, musician, composer, lyricist and film actor who was born in New Jersey in 1908, (the same year as Lombard), but raised in California. He took New York City, national radio and the recording world by storm in 1931 when he was just 23 years old. They met in the early fall of 1933 shortly after Carole Lombard's divorce from William Powell while Russ was doing a return engagement at a major nightclub in Los Angeles. She was on a date with screenwriter Robert Riskin. Russ focused on her as he sang and she returned his gaze. They both liked what they saw. Riskin predicted astutely that she would soon be hearing from Mr. Columbo. He was correct. A dozen yellow roses arrived for Carole at her Rexford Drive home in Beverly Hills from Russ the next morning. This film clip from "Broadway Thru a Keyhole" with Russ Columbo and Constance Cummings was made in 1933. It shows what Russ looked and sounded like when performing before an audience at that time. Russ Columbo has been called a fervent Roman Catholic by his biographer, Tony Toran. Born into a large Italian-American family, he embraced the core tenets of that religion, (beginning with "I am the resurrection and the life..."), with a zeal that was all his own. Russ was probably drawn deeply into Catholicism by his grief over the death of his eldest sister, Fannie, during the Great Pandemic of 1919. Only eleven years old at the time, he was deeply affected by her sudden death. Fannie and her husband Joe Lo Duca had raised Russ from infancy including moving him with them to California when he was only five years old while his biological parents were busy running various businesses to support their large family on the East coast. Fannie's husband was the one who initiated Russ' formal musical training with lessons on the violin. Up until his sister died in 1919 his parents played almost the role of grandparents to him. He became closer to his parents and very protective of his mother after his sister's death when he saw how deeply she grieved for her daughter. Boy to man. (left) Russ as a boy and (right) a rare color photograph of Russ in the 1930's. Perhaps because of his Italian background, Russ Columbo missed the prudishness and sexual anxiety sometimes associated with the Irish dominated Catholic Church in America. He grew up to be both a happy and handsome young man and when he actively courted a woman it was as both a body and a soul. To him, first you won with the body and then you challenged the soul. And this is how he approached Carole Lombard. To Lombard who came of age in the hedonistic 1920's Hollywood where scoring and keeping track was the norm, it was both a novel thought and at the same time very refreshing. Russ Columbo with Carole Lombard's tennis instructor, Eleanor Tennant, whom Carole nicknamed "Teach." 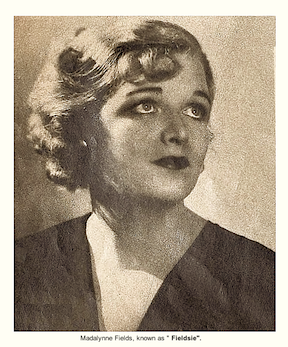 And Lombard taking lesson from Alice Marble, a protege of Tennant. Photo of Russ at play in 1934. Warren Clark, the journalist, said Tennent told him that Russ played tennis with the speed and agility of a Bill Tillden. Their relationship had several stages. Russ, an intensely romantic man, was a novelty for Lombard. Initially she wondered if he was too good to be true. He was unlike anyone she had ever met before. He seemed to want more from her than she ever gave away to anyone yet he also seemed willing and eager to give her everything of himself in return. Russ was enchanted by Carole. He idolized her. A great beauty, her independence and her gusto for life were exhilarating to him. Her wisecracking profanity, a put off to some men, didn't seem to bother him. (She probably very rarely, if ever, used it on him.) Yet he had to wonder if she was ready to commit to anyone. Russ and Carole shared a habit in that they both liked to sleep as they were created. Russ particularly liked wrapping his arms around her and holding her close while humming so she could feel the vibrations coming from within his chest. When her secretary, Madalynne Fields, told him that Lombard loved him physically and that should be enough for him, he responded to her that he was "happy that the physical part at least is fine." But he was deeply offended by "Fieldsie's" comment and he told Lombard so. He didn't want her as just another fling, nor did he intend to be one for her. While their relationship was passionate from the beginning, Russ wanted more. He wanted to marry Carole because he felt that they completed one another. 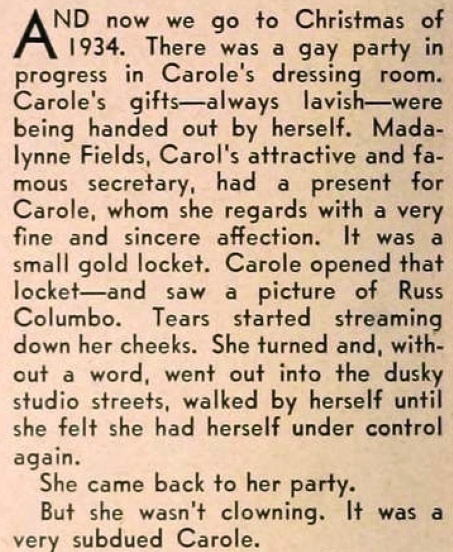 By early 1934 Russ realized that he also had to win over Madalynne Fields, Lombard's social secretary and companion, as an ally to make real progress with Carole. And he was well along in the process. Lombard was then working with John Barrymore, an acting legend but also an unapologetic masher, on what would be her breakout motion picture, the screwball comedy "Twentieth Century". In this relaxed, congenial photograph, (below), we see the team of Columbo and Lombard at work. They were able to bring out the best in the people around them. Russ chats with "Fieldsie" Lombard's secretary, while Carole visits with John Barrymore at a public event. Was Lombard keeping her end of a deal she made with Barrymore at the start of making "Twentieth Century" with this double date? The deal was that if he promised to keep his hands to himself while they filmed they'd have a date when they finished making the movie. Barrymore, rather than being offended, became both a friend and a professional admirer of Lombard. Perhaps this is what Russ meant by completing one another. Psychologically speaking, it was probably the healthiest relationship Carole was ever involved with in her entire life. Looking the 6 ft. tall and beaming Russ Columbo eye to eye adoringly from atop platform shoes. Russ had the potential to be a megastar greater than Lombard and she was showbiz savvy enough to know it. (When they met Russ was already a celebrated radio and recording star with broader national recognition than Lombard.) She was as happy with the possibility as he was delighted with her first critical success in "Twentieth Century". By mid-1934 Russ had a national radio show for NBC, just signed a new recording contract with a major recording studio, performed live at top venues and was an emerging movie star. Within a period of a year he completed a short for Warner Bros., two films for 20th Century and he signed with Universal Studios. They planned to use him in starring roles in musicals initially and then to broaden their use of him with comedic and dramatic roles. Russ achieved most of this career progress on his own after he broke with his talented but also unpredictable and wily manager and promoter Con Conrad in 1933. (Columbo learned the hard way why everyone called Conrad "Con".) He arrived in Los Angeles from New York after completing a nationwide singing tour organized by NBC seriously ill with a cold and the flu and nearly broke. He found that all of his contracts set up by Conrad had been cancelled. Yet he did not return to his parents' home, rather he checked into a suite at the Beverly Wilshire Hotel, got over his illness, and then went about rebuilding his career -- without ever again using the services of "Con" Conrad. Before returning to Hollywood from New York he filmed a "short" for Warner Brothers. In "That Goes Double", released in July of 1933, Russ demonstrated not only fine comic timing but also a keen sense of self-effacing humor. And he sang several songs including his theme song, "Prisoner of Love". Russ played both himself and his double in this 20 minute short film. Russ was also a featured guest on a test of television at Madison Square Garden in New York City, circa 1932. Earlier in his career he opened the Empire Room at the new Waldorf Astoria in New York City as a headliner with a sold out engagement over the holidays in 1931-32 when he was 23 years old. He held the record for live performances at the vast Paramount Theater in Brooklyn for nearly a quarter of a century. Russ in white tie and tails. Pietro Cimini, Los Angeles Philharmonic conductor and one of the premier opera coaches of the era, said Columbo had the voice and the aptitude to be an opera singer of the first magnitude. A baritone, Russ sang both popular music and jazz and he could also sing opera, but he was not doing so professionally. (He intentionally kept his operatic great voice well hidden from the public.) Only once, while performing onstage in New York, after being stung by a reviewer who panned crooners as second rate singers who relied on a microphone just to be heard, he stepped away from the microphone midway through a performance, motioned to the orchestra to play, and then sang an aria in an operatic voice that could be heard up to the rafters. He stunned and delighted his audience. Russ played the piano professionally and was a classically trained violinist. During another performance when his audience would not let him leave the stage even after he sang two encores, he didn't know what to do next. So he borrowed a violin from an orchestra member and played a virtuoso classical piece for them. He brought the house down. Russ was a musical prodigy and made his stage debut on a guitar at a church function when he was five years old. (According to his biographer, Tony Toran, he walked on stage for that engagement with a guitar that was almost bigger than he was.) He played the violin professionally from the age of 13 -- some say nine. Russ worked from an early age while in school to help his parents support their large family. He played virtually all instruments from the violin, guitar, and piano to the accordion and the clarinet. And he also helped out in the family restaurant. (left) Master Russell Columbo, as he was billed at age 13 and (right) Russ Columbo at age 20. Russ as a teenager in a song and dance routine for a family vaudeville act. Inscribed: "To my Darling Sisters, Russell. Russ was in fact raised from infancy by his eldest sister, Fannie, born in the United States, and her husband Joe Lo Duca. Hence Russ' lack of an Italian accent when speaking English. He was effectively, if not in fact, a second generation American. Russ Columbo and Leon Belasky in 1927 as the Hollywood Serenaders. (Photo is part of the author's collection.) Their teaming lasted from sometime in 1927, when Columbo was just 19 years old and Belasky was 26, until sometime in 1928 . They appeared as the Hollywood Serenaders as staff artists on the Warner Bros. owned radio station KFWB at least until February of 1928. By 1932 a 24 year old Russ Columbo hired Benny Goodman to play the clarinet and to serve as back-up conductor for the Russ Columbo Orchestra while Russ sang. And he also hired the young and the soon to be famous Gene Krupa as a drummer for his orchestra. Not only was he a composer of music but he was also a published lyricist of hit songs. And he was teaching Lombard both skills, sometimes in the middle of the night, as Carole later humorously and privately explained to a journalist friend. She said "we'd be in the hay and in between we'd make up songs. Can you imagine it? Listen, there were a few times we got so interested in the songs we'd forget to get our ashes hauled!" As a comparison, Bing Crosby, while a very talented singer and entertainer, couldn't even read music. Russ Columbo at the piano, circa 1934. Photo by Roy D. MacClean. In addition to his musical talents and skills, Russ was blessed with a dramatic physical stage presence. One contemporary New York critic said that "while he may have been born of Italian parentage, when he stepped into the spotlight on stage with his glistening black hair, chiseled facial features and athletic physique he looked to all the world like the statue of a Greek god come to life. And with his flashing black eyes and gleaming white teeth, he had a smile that could melt a sphinx." After returning to Los Angeles from New York in 1933, Russ played a leading role in 20th Century's, (soon to be 20th Century Fox), "Broadway Thru A Keyhole" co-starring with Constance Cummings. Almost 70 years later, Cummings, when asked about her personal experience in working with Russ recalled him very fondly as being both extremely talented and a pleasure to work with. Constance Cummings in 1969. She had a long and successful theater career both in London and New York after she left Hollywood in the mid-1930's. Cummings, born in Seattle, was engaged to British playwright and screenwriter Benn Levy, MBE, when she worked on Broadway Thru and Keyhole and they married shortly thereafter. In 1974, Cummings, who resided in the UK for many decades, was made a Commander of the Order of the British Empire for her contributions to the British entertainment industry. Cummings died in November of 2005 at the age of 95. The YouTube clip from their film at the beginning of this blog and the photos below capture their sense of fun and their clear screen chemistry. Constance Cummings and Russ Columbo in "Broadway Thru a Keyhole", 1933, above and below. The wedding scene from "Broadway Thru a Keyhole". Russ set a goal for himself with that film to define a new persona for the screen, not just a rough and bluff "he man" but a three dimensional individual with feelings, foibles and sensitivities. He succeeded. He also filmed a delightful guest singing appearance with Constance Bennett in 20th Century's "Moulin Rouge." Russ Columbo with Constance Bennett in 20th Century's "Moulin Rouge." Russ Columbo and June Knight in "Wake Up and Dream", 1934. Henry Armetta as "Cellini" and Russ Columbo as "Paul Scotti" in "Wake Up and Dream", 1934. Russ Columbo and Wini Shaw in "Wake Up and Dream", 1934. Richard Pryor, June Knight and Russ Columbo in Wake Up and Dream, 1934. The earlier photo of a teenage Russell in a song and dance act shows that there was nothing unusual in Russ doing dance routines on stage. He considered himself a good dancer. By the summer of 1934, both Carole Lombard and Russ Columbo were deeply in love with each other. Carole had agreed to take instructions in Catholicism as a preliminary step to marriage. She was eager to see Russ firmly established in films and she did everything she could possible do to help him achieve that end. Russ Columbo and Carole Lombard out and about in 1934. Carole nicknamed him "Roogie" an anglicized version of Ruggiero, Russ's name in Italian. Russ's nickname for Carole was "Pookie", a term of deep affection. Russ on the diving board outside his home in the summer of 1934. Carole, never coy, referred to Russ as "a handsome hunk". Russ Columbo in a Fox screen test. Carole was becoming heavily involved in managing Russ's burgeoning career. Despite the fact that it was to be the busiest year of her own work life she was on the set of "Wake Up and Dream" every time Russ was in front of the camera. She was also in the control room for his radio broadcasts, whenever possible. She had become the defacto manager of his career. Russ loved her as a person and he trusted her judgment as an entertainment professional. Carole met a deep seated need of Russ, she was someone he could love unconditionally. Russ Columbo and chorus in "Wake Up and Dream". Russ Columbo relaxing with a draft, probably on the set of "Wake Up and Dream" in the summer of 1934. With Lombard's encouragement Russ now decided to take additional voice lessons to strengthen his baritone voice not only for the role of Gaylord Ravenal in "Showboat" but also to sing opera professionally in the future, a goal that he had secretly held since childhood. A newspaper article written at the time expressed concern that he not forget his popular music roots or loose his incredibly smooth sound in the process. The writer pointed out that while there were many good opera singers there was only one Russ Columbo. And then very tragically Russ Columbo was killed on Sunday, September 2, 1934, the innocent victim of an accidental shooting. He was 26 years old when he died. According to Hollywood reporter Cecil Deane, Carole Lombard took charge of the arrangements for Russ' funeral. Russ's pall bearers included Stuart Peters, Carole's brother; Walter Lang, the film director and future husband of Madalynne Fields, Carole's friend, (He would later direct the film version of "The King and I"); actors Gilbert Roland and Zeppo Marx, (substituting for director, Lowell Sherman, who fell ill and had to cancel. Sherman died later that year. ); musician, Sheldon Keate Callaway; and singer, Bing Crosby. The pall of white gardenias, Russ's favorite flower, was given by Carole as an expression of her love. The same flowers were also worn by all of the pall bearers. The interior of the Church of the Blessed Sacrament in Hollywood. Lead, Kindly Light - Voice Male - the hymn that Russ Columbo requested be performed a capella as the recessional for his funeral. In the weeks before his death both he and Carole experienced an almost overwhelming sense of dread and doom. A few days before he died he spoke with Father G.G. Fox, S.J., and told him how he wanted his funeral to proceed if he was the one who died. And then as recounted by Monsigneur McCoy who presided at his funeral, he made his last confession. A distraught and sobbing Carole Lombard is seen (above) leaving the Church of the Blessed Sacrament in Hollywood with her mother and members of the Columbo family after Russ' funeral. During the service Carole sat in the front pew with her mother and Russ' family in the position of primary mourner. Sobbing quietly through most of the service, she broke down and wept uncontrollably several times. The Great Mausoleum at Forest Lawn Memorial Park where Russ Columbo is entombed "in a modestly priced crypt" in the Sanctuary of Vespers. Note the still empty crypt directly below Russ Columbo's tomb. Carole Lombard was inconsolable for months following Russ' death but when she did move onward she courageously lived life to the full. Film critics have pointed out that the warm, luminescent screen presence we associate with her today was a result of a new maturity that grew out of her first experiencing real love with Russ and then real grief over his loss. The differences in her film performances pre-Russ Columbo and post-Russ Columbo are remarkable. She was transformed. Lombard after her relationship with Russ. They wanted "a home with room for more than two". "Carole had met Russ Colombo, the handsome young man with the golden voice. She had become his greatest fan, then his worshiper. And he died.... The death of Russ Columbo made Carole Lombard... When she returned to the screen, after the long absence that followed his death, she was a better actress than she had ever been. She was actually a comedienne! Her comedy was of the highest type, that sort whose roots are planted in the deep, rich soil of sorrow. Suffering and solitude had mellowed and softened her, shaped her character, enlarged her understanding and her sympathy." Welcomed back into the social life of the Hollywood community in 1935. Carole is seen here at a party at the home of former co-star Ricardo Cortez on her right as we look at the photo. Two other former co-stars hover around her protectively. They are Cary Grant and Clark Gable. While Carole moved on with her life after Russ' death the void left in her heart was never completely filled. Her continued contact with Russ' family after his death is a testament both to her character as a person and her deep feelings for Russ as an individual. Russ Columbo' place in entertainment history has been helped immensely by the advent of Internet technology. Almost his entire songbook is now available on the world-wide-web. His lush voice and the utter sincerity of his delivery have captured the attention and the admiration of an entirely new generation of listeners around the world. Critics, who in their zealous promotion of emerging swing music discounted Columbo's contributions to the great American songbook, are now seen as having had an agenda and are considered partial. A new generation of music critics is actively reconsidering Russ' work and his contributions to American music. His time at film making was brief, but the promise he showed was very real. His personal charisma comes across on film just as readily as it did in person onstage, in his recordings and performances over the radio. He easily projects an appealing warmth and a sense of humor that was genuine. It takes little imagination to see that Russ was making the transition from radio and recording star to motion picture icon. But it was as a human being that Russ Columbo truly succeeded in his relatively short life. He loved his God, he loved music and he loved Carole Lombard with a deep passion, a sincerity and a sweetness that she had never experienced either before or after. Perhaps this is why she regarded him as the great love of her life and chose to be buried near him. Carole Lombard wearing a heart shaped locket circa 1937 as photographed by George Hurrell. May they rest in peace....awaiting, (if you are a believer), the day of the resurrection of the body, judgment and the rewards of eternal life. In memory of Stella D. Cwiklo, née Wozniak, 1914-2001, a stalwart Russ Columbo fan who provided her insights to the author. You posted a picture of my grandmother in this post. Til now I had never seen a picture of her...as she died before I was born. Thank you so much! I just added another photo of your grandmother . I always thought the 'candid' photos of Carole Lombard and Clark Gable looked too staged to be the real deal. After reading your articles, things make more sense. I hardly thought Carole Lombard would tolerate Gable's philandering. I have read a lot on Garbo and found MGM's publicity stunts and control of the stars appalling, but not surprising. I have never liked Gable nor thought much of him (bad teeth and those ears!) but I have always loved Lombard. The photos of her and Russ Columbo seemed much more 'candid' and natural, not part of the publicity stunts from a studio. Really enjoyed the pieces of Lombard, I wish there would be more books about her, so odd that there aren't! Love, love, love everything about her. Thank you for your open, honest, and detailed history of Russ Columbo. As well as the details of what sound to be a match made in heaven with Carole Lombard. I found it all very informative and enjoying to read. Thank you for your comments. It was tough writing this as my late mother was a big fan of Columbo. He died a week before my parents' wedding. I only recalled snippets of conversation about him growing up. When I encountered the Life Magazine cover of Lombard I was perplexed. It seemed so unlike her vivacious public persona. As I dug deeper I came to realize why that was so.